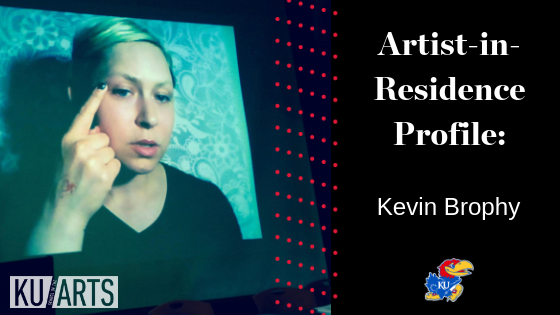 Kevin Brophy is the 2018-19 Artist-in-Residence for the Department of Visual Art and Hashinger Hall Dorm. Brophy earned her B.A. in Studio Art and Creative Writing from the University of South Florida, and her MFA from Carnegie Mellon University as a Regina & Marlin Miller Fellow. She has exhibited at Tampa Museum of Art and Contemporary Art Museum of Tampa; performed at MoCA Cleveland and at the Carnegie Museum of Art for Opening Engagement, Pittsburgh; and intervened in H&M at International Mall, Tampa and the Perez Art Museum Miami. Performance and interventions online and off. My practice is language and project-based so it takes many forms. It is mutable across platforms. In a way, always. I don't divorce my art from my writing, and I've practiced both my entire life. Being something and being interested in something are two different things. When I started college I planned on majoring in astrophysics, but I was only interested in theoretics--I gravitated towards conceptual art. I found a place for that energy. I am an artist, but I'm not at all attached to that identity. I knew I'd get an MFA in art rather than writing when I realized I was a better writer than an artist. I wanted to pursue the field I had more space to grow and learn within. But, in short, I knew I'd be an artist when I realized that being an artist meant that I could be all the things under a convenient umbrella term or profession. Teaching creates a space where I can continue to learn: socially, textually, politically. Teaching is about mutual exchange. And I am generous with my students, and they are generous with me. Mentoring doesn't end with a course--I talk and share with certain former students all the time. I labor over the advice I give them. Teaching is one of the most transformative performances I can think of. I know that sounds very twee and overly earnest, but I am fine with that. I knew I wanted to be a teacher a couple of years ago when I became aware of institutional power dynamics between student and teacher from the other side, as a grad student situated squarely between the two. Things became transparent. I worked with professors that I deeply respected and who I still look to for advice. I also met professors that I wanted to usurp. I will not be explicit in my critique, here, but it isn't hard to imagine the imposition, toxicity, bias, and laziness I might be referring to. I can offer a better option. And, when it comes down to it, professors are given the privilege and responsibility to dictate their student's cultural lens. That has weight. That has value. I am inspired by terrible things. Things like systemic oppression. Inspired to create rupture in harmful tradition. I point to performance art as opposed to the other media I work in because the sentiments of that practice align with mine; guided by a need to transgress, to challenge authority and convention, to disrupt the status quo. *I want to burn this whole world down* It's all very 'young' and impetuous, I know. I'm a walking manifesto, full embarrassment. But, I've come to terms with that. It's "a look." 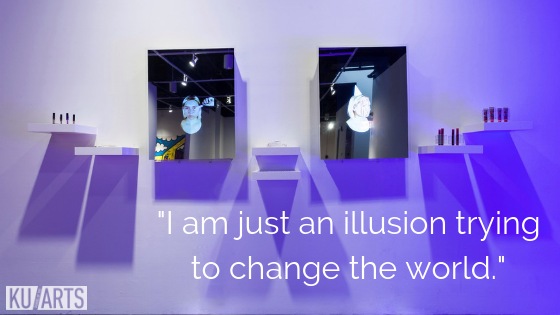 And, I am just an illusion trying to change the world. This is my first time in Kansas. I think the sky is beautiful. I am too aware that my "intellectuals and historical figures" list would be predicated on a culture and history molded by one dominant body and that it would unintentionally veer toward long-venerated men, 'masters', 'myths'...'monsters', and a few 'crazy', 'hysterical'...'allowed' white women. And, I don't necessarily want to listen to corpses pontificate. But, I understand that this question is meant to be didactic. About me. About culture. Bell Hooks said, "...popular culture is where the pedagogy is, it's where the learning is." So I'm just going to spawn Karin Dreijer (Fever Ray) and their touring band. "Dinner is a seance. Dessert is a rave."